Went there a couple of weeks ago on a Monday evening. The food menu is unexpectedly long. Can they really provide good quality for so many dishes? We had the mixed grill and the lamb shank. Both were good, although my mixed grill was missing its fried egg. Sadly, not an easy place to work as there is no WiFi. Not a bad option to the east of Didcot and cheaper and less pretentious than its rivals the Bear at Home and the Red Lion in neighbouring villages. A whopping great goose eggs, ham and chips was home made and went down well with my dining partner while Wadworth's beers are on tap. Family run with a gigantic pooch guarding the threshold, this is the kind of pub Milton's Admiral Benbow could be. Dear "Mike & the team" thank you for all your personal assurances, which I see are meaningless. CLOSED AGAIN ! We sincerely apologize that you found us closed on Tuesday lunchtime. Unfortunately, certain circumstances had arisen which meant that we were unable to open as per normal. We did re-open that night and are open throughout the rest of this week - serving great food and real ales. I personally would like to add that this will not be turning into a regular thing. 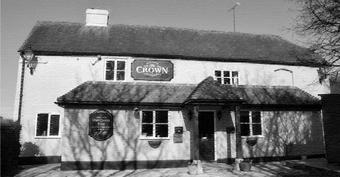 Mike and the team @ The Crown Inn.